Father's Day is right around the corner. While presents and cards are nice to give your grandfather, chances are good that he'll most enjoy one of life's greatest gifts: simply spending time together with you. "If he has projects he likes to do, ask him to show you how it's done." If your grandfather enjoys a special hobby, why not join him for the day? Is grandpa an avid golfer? Perhaps he spends his afternoons in the garden or at his workshop doing carpentry projects. If your grandfather has an activity he really likes to do in his free time, why not join him for the day? Treat him to a tee time at his favorite course or buy a few rounds at the bowling alley he frequents. If he has projects he likes to do, ask him to show you how it's done and learn along side him for a while. Even if his favorite hobbies aren't things you'd choose for yourself, he'll be thrilled at the chance to teach them to you. And what could be better than doing his personal pastime with his beloved son, daughter or grandchild? Help carry on the legacy. Catching a summer blockbuster together is another great way to spend time with your grandfather. Did he enjoy seeing the original Alien movie in the 70s? Take him to see the latest prequel out in theaters. From Star Wars to Planet of the Apes, many old classics are getting reboots and new chapters added in the coming months, so consider a gift that promises a future date to see the newest addition to his favorite series. Some local theaters may also hold showings of classic films, which will allow you to see one of his favorites from when he was your age. You can also try a brand-new flick in his favorite genre, sharing modern comedies, spy thrillers or science fiction sagas together. After you go see a film, stop somewhere for lunch or dinner so you can chat about what you watched. He can share his opinions on the movie and tell stories about his favorite movies from when he was younger. It's a nice way to end the day after connecting and building new memories. Experience together one of your grandfather's favorite activities this Father's Day. If you're an adult child trying to find fun activities your kids can do with their grandfather, a book is a good choice. Pick out a picture book that your child can gift to your parents. Have your kid sign the book if they're old enough, and include a sweet message to their grandfather. Then, after they give the book to grandpa, they can ask him to read it to them. It's a simple way to help them bond. Studies have shown that intergenerational bonding can actually help keep seniors healthier, while grandchildren get more learning opportunities by communicating with older loved ones. Whether it's a minor league baseball game you see that day or tickets to an NFL match up you can do in the fall, order seats for his favorite game or team and give them on Father's Day. Sporting events are great activities because they give you plenty to engage in and talk about as you watch the action of the game. Don't forget to budget for stadium food - it's an essential part of the game day experience. Even the simplest ways to spend time together can make treasured memories for you both. Go out for a meal at his favorite restaurant to just have some time to sit and chat together. If he likes to cook, prepare a meal together for the rest of the family and then have everyone join to eat. He'll likely love the extra set of hands in the kitchen and you can learn some of his famed seasoning tips. Grandparents.com suggests grilling together as a fun activity, should the weather cooperate. "Get the family together to sit and listen to grandpa's stories." Get the family together to sit and listen to grandpa's stories. He'll feel valued and appreciated, and you'll likely get to learn something new. The Huffington Post recommends discussing and drawing out your family tree, for example. Your grandfather can share tales about his childhood and other relatives to help you plot on their branches on the tree. You could end up with great stories, a better understanding of where you come from, and a treasured keepsake you can pass down to your children someday. They say music is a universal language, so why not spend time sharing music together? Ask your grandfather about his favorite songs and put them on a playlist for him that you listen to together. You should also make a compilation of your favorite songs to present to him as well to help him feel connected to your interests and modern pop culture. If either of you plays an instrument, take it out and perform favorite numbers. Learning one of his favorite songs and performing it with or for him is a touching way to honor your relationship. 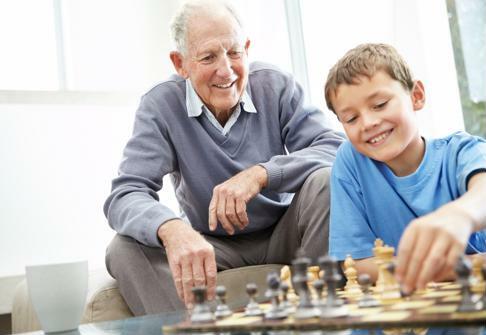 There are a number of ways you can spend time with your grandfather this Father's Day. Think about what would mean the most to him and find ways to share in those activities. He's sure to appreciate the love and attention you provide, and you'll make memories of your grandfather that you can treasure forever.